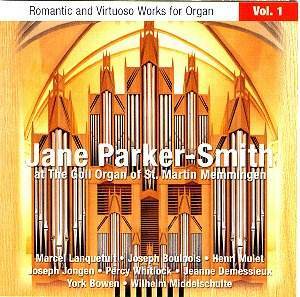 The range of works on this CD makes for a varied, rich and consistently engaging programme. The Sonata Eroica by Jongen is famous and there are the large-scale pieces of late-romantic repertoire by the German composer Wilhelm Middelschulte and the Englishman Percy Whitlock. In addition the listener has the chance to enjoy less familiar, shorter pieces from the English and French repertoire. These composers are very well known but such is the quality of this recording that one can imagine listeners captivated by one of these works wanting to search out others by the same composer. The Goll organ sounds superb and supports perfectly the whole programme. It is an organ with French as well as German and English sounds. It offers beautiful and warm flutes as well as powerful reeds. The strings also are such a pleasure to hear <sample 1: track 2 2�23��> The effect is complemented by the acoustics of the church, which at 236 feet length and 66 feet height produces ample reverberation. Parker-Smith proves yet again that she is at home with this repertoire. All the works are performed with confidence, dexterity and an extremely high sense of musicality <sample 2: track 3 3�09��> thus allowing everything to be heard clearly. This CD is one of those in which a great organ, a great performer and a very well balanced program meet to brings to the listener the very best musical quality <sample 3: track 4 8�36��>.